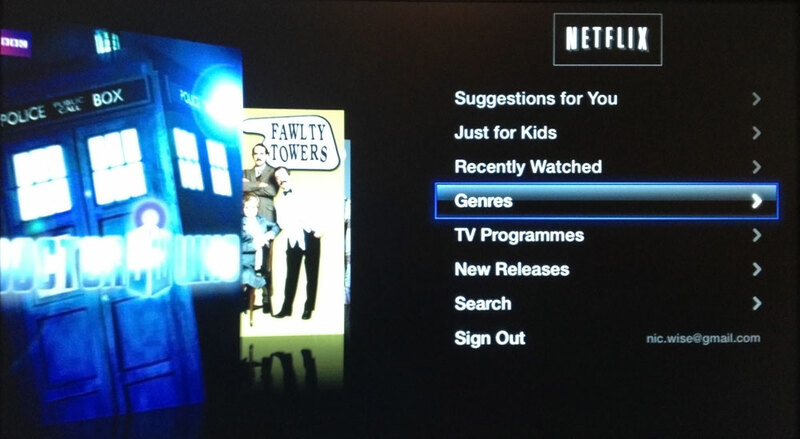 TL;DR: Netflix (UK) is nice, but it's mindless TV without the schedule. We'll keep it, but mostly for the cost-vrs-iTunes aspect. Netflix was released in the UK this week, and unsurprisingly, I signed up right away. For £6/month, it's a remarkably good deal. I'm sure the selection isn't as good as the US version, but overall, it's a well done experience, with enough interesting content to keep it around. I find it does encourage more "mindless" watching tho - sitting down and finding something to watch, rather than thinking "oh, I want to watch X, I'll sit down and watch it". This aspect, I do NOT like, as thats the exact reason we got rid of our (broadcast) TV in the first place. So far, I've tried it on the iPad, iPhone and AppleTV. It works great on the first two, but it really shines on the AppleTV. It's presented as a menu item, like all the others. Once in there, you can find movies and TV, and - shock horror - hit play and watch them. From a technical standpoint, this is the most impressive bit. The video starts within 3 seconds, even on our fairly slow broadband (~6Mbps), and even at peak time. I can fast forward or rewind immediately, and the picture quality is excellent. Where does Netflix sit in our home ecosystem? Just below iTunes, and above "buy a DVD set from Amazon". When we got rid of our Broadcast TV connection, we decided that we still wanted to pay for content, and we still do: iTunes, DVD sets (2nd hand, usually) and iPlayer (ok... we don't pay, but we dont legally have to). At the moment, anything new comes from either iTunes (if it's available in the US), iPlayer (if it's on the BBC - I've given up on the other channels here) or, in a few very rare cases, "my aunty" (thanks, NZ tweeps, for that term). Anything older - usually available on DVD - comes via Amazon. The Amazon market place allows for second hand DVD sales, which means we can pick up a $50 US box set for £5 + postage, and resell it for the same amount when we are done. It's almost like getting it for free, with a little inconvenience in the postage. I think this is what Netflix will replace - the DVD box set buy-and-watch-and-sell cycle. Most of the content is older, but for £6/month, it's so cheap that if we just watch 3 movies a month on it, it's paid for itself vrs iTunes. If we watch one DVD box set, it's paid for itself 10x. The critical piece will be self-policing, to make sure we don't fall back into the mindless TV mode. I did last night (watching Mythbusters and a bit of Dune), and it felt kinda dirty. But it may be worth it - for a small monthly fee, it's will replace a major source of my "aunty"-ing, and like with music, I WANT to pay for content if I can. Now, if Stars in the US (Dexter, Californication) would just put shows up on iTunes when they are first broadcast (not 6-12 months after), I'd have no need for the uAunty at all. And that would make me feel very good. Did Apple move it's manufacturing to "the cloud"?